MEA era since 2016, the opportunities for the creative industry are widening. In the past 2 years, the creative economy has contributed approximately 7% of Indonesia's GDP. The business potential in the creative industry sector is still widely open to work by business people in Indonesia. Creative industry channels have many types. As one example of this is the knitted business that is now becoming popular, both among adults, adolescents and children. Partners in this PKM are Barkarajuta in Savira, Beji-Municipality of Batu Housing, and Omah Benthelan N & N Collection in Lowokwaru Sub-District Malang. Output targets are: (1) Increasing business productivity both in quality and quantity, by increasing production facilities, (2) Partners understanding and possessing skills and knowledge of accounting records, creative industry business, financial management, and operating accounting software, (3) Making simple accounting software, and (4) Publications to national scientific journals, mass media and IPR. The results of PKM activities provide a significant increase in both partners in the form of increasing the number of new products, product quantity, order quantity and product quality. IRAWATI, Rina; PRASETYO, Irawan Budi. Pemanfaatan Mesin Jahit High Speed Electric Untuk Peningkatan Industri Kreatif Rajutan (Crochet Goods) di Malang. 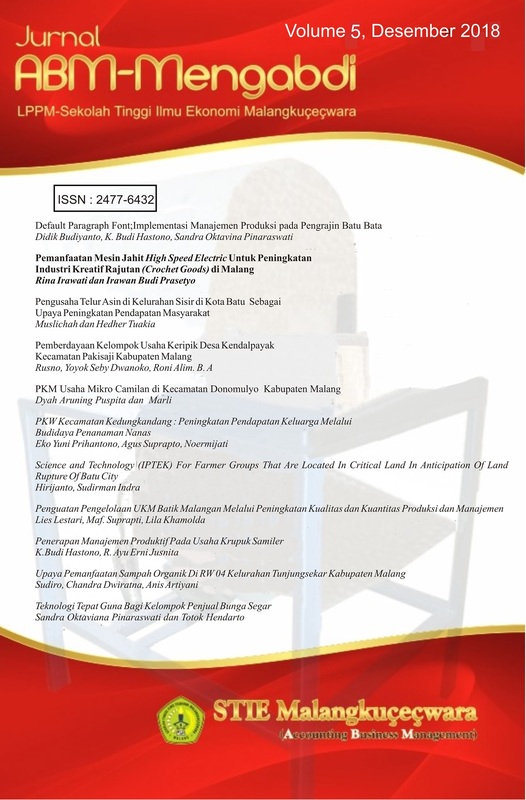 Jurnal ABM Mengabdi, [S.l. ], v. 5, p. 11-23, dec. 2018. ISSN 2477-6432. Available at: <http://journal.stie-mce.ac.id/index.php/jam/article/view/362>. Date accessed: 20 apr. 2019.